Who Is This Now? Dale. Why Are We Watching Him? 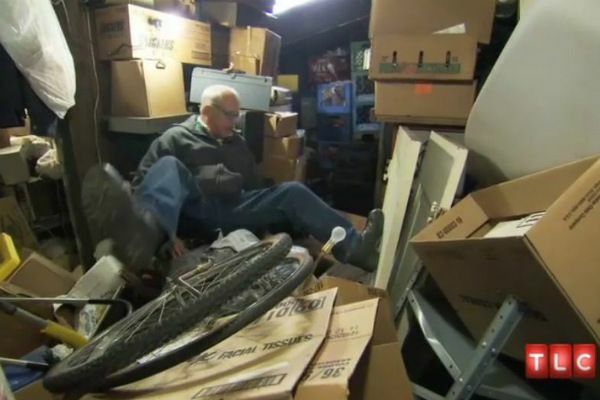 He’s seeking help for his hoarding issues. How Did He Get Here? Dale’s parents had a terrible marriage and fought all the time, which Dale claims is the reason that he buried himself in things rather than pursuing a romantic relationship that could have ended in his getting married himself. And that marriage must have been REALLY bad, because Dale owns five houses and has hoarded them all. What’s the Grossest Thing We See? Seeing a room with garbage shin-deep is nothing remarkable on this show. Even so, one’s imagination goes to some horrible places when that room is the bathroom. Because what’s underneath? WHAT IS UNDERNEATH? What Have We Learned? Emptying your houses of tools — of which you have so many that they fill the entire field where they are about to be auctioned off — is progress. Going through the auction and buying things back from yourself is not. Who Is This Now? Priscilla and David. How Did They Get Here? Priscilla’s sister Anna married Josh Duggar, of The Duggars. What’s the Grossest Thing We See? All the talk of “purity” (read: virginity) is kind of grim, but it’s not as bad as the 20-piece violin ensemble playing at the wedding. Though a chyron informs us that all the Duggars learn to play the violin at age 5, they evidently wait until much later to learn how to tune them. What Have We Learned? So far her parents are keeping her in line (and in skirts), but Jinger might be a flight risk. Who Is This Now? Jesse. Why Are We Watching Him? Matchmaker Lori Zaslow is trying to find him his soul mate. How Did He Get Here? Evidently he can’t meet women on his own? He’s a traffic reporter; maybe he talks too loud. What Have We Learned? Because the dudes are the clients at Project Soulmate, there is just no more thankless job than being one of Lori’s hos. Who Is This Now? Cindy Margolis. Why Are We Watching Her? She’s pushing the boundaries of what’s acceptable to outsource to a paid child-care professional with her new nanny, Scott. How Did She Get Here? Back in her heyday, she was the most downloaded woman on the Internet. What Have We Learned? Cindy has a pretty big house and, apparently, no job, so I guess having been the most downloaded woman on the Internet back in the Dark Ages is the kind of thing that can set you up for life? Who Is This Now? Cyrus and Corky. Why Are We Watching Them? They’re helping the men of Yemassee to prepare their daughters for a beauty pageant. How Did They Get Here? For the purposes of a “social experiment” (reality-TV gimmick), the producers of The Week the Women Went have removed all of Yemassee’s women to a resort in Florida, leaving the town’s men to fend for themselves. What Have We Learned? The real men of Yemassee, South Carolina, might be even more useless than the fake dads of virtually any cleaning-product commercial. Tara Ariano is among the least downloaded women on the Internet.